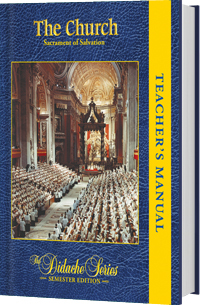 This Teacher's Manual is designed to help the instructor actively engage students in discussions, activities, and reviews that investigate the origin, nature, and effects of the efficacious signs of God's grace that are the Church's greatest treasures. It is a companion to the textbook The Church: Sacrament of Salvation. The textbook, The Church: Sacrament of Salvation, corresponds to Book IV: Jesus Christ's Mission Continues in the World Today (The Church) in the curriculum framework.